All I can say is – WOW! 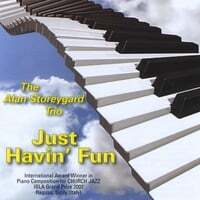 Alan is a fully-rounded talent in many other arenas as well… the promo sheet calls him a “jazz physician” (he’s been a family doctor for nearly four decades in his home turf, Jacksonville, Arkansas), and quotes him saying “Music is medicine for the soul”… I can tell you (in the immediate) that he won’t get any argument from the “Zzaj quarter” with that statement… in point of fact, if we could pipe music like this into the White House and other political abodes as well, I doubt we would be living in such troubled times. 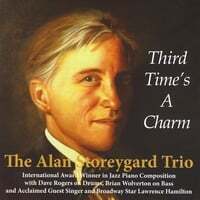 I have no doubt that if we could get the POTUS to sit back & groove to Alan’s interpretation of “Beethoven’s Ninth Symphony“, with his Alan Storeygard trio, things would change (for the better) in a hurry… what a nice blend of jazz and classical this tune turned out to be! 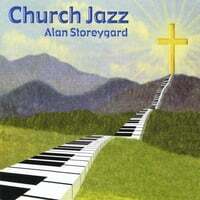 For this reviewer, though, it is the tasty fusion of Alan’s superb piano on “Jesu, Joy of Man’s Desire” (Bach) that captured my vote for personal favorite of the nine songs offered up for your aural pleasure… thinking back to my grandmother on her piano bench in Erie, Pennsylvania (where I grew up), this is exactly the kind of song I can see her playing… and if she were still around to listen to Doctor Storeygard’s masterful approach to this inspiring piece of music, I’ve no doubt she would contact him and thank him for his healing abilities. This is Grammy material for sure! If you’re looking for music that is full of both anchors to our musical past and delicious reminders of how far we’ve moved forward, you’ll definitely want to purchase this great album. I give Alan and his crew a MOST HIGHLY RECOMMENDED, with an “EQ” (energy quotient) rating of 4.99 for this beautiful sonic experience. 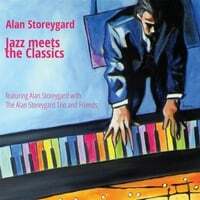 Get more information about Alan and his projects by reading his bio on the Alan Storeygard website.